Duo A La Carte: (Julie Husband and Heidi Peters) commissioned and premiered Excursions for Woodwind Doubler (baritone sax, piccolo, flute, alto flute) and Piano Dec. 2012. This fun – filled piece illustrates the versatility, styles and special characteristics of the woodwind instruments (and piano), in their musical encounters with well-known Manitoba folk statues (real & imaginary!). More performances are slated with added percussion & bass for the fall of 2014. 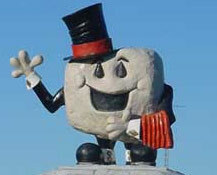 The Happy Rock (!) – Gladstone MB Movement No. 1.